If you find the Before and After pictures shocking, they were for me as well. 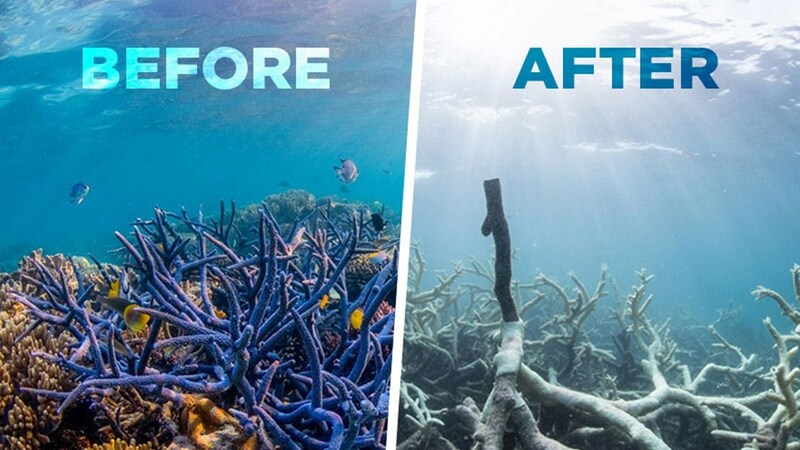 In 2013, while snorkeling off Port Douglas on Australia’s Great Barrier Reef, even the boat captain had a hard time finding any coral area that wasn’t bleached of all color with little to no visible marine life. 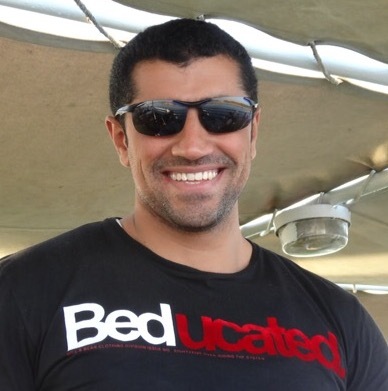 As a certified diver, who has dove many reefs, I was ready to see an incredible display of aquatic life. Everything looked absolutely dead. “What happened?” I asked. The explanation back then was pollution. No one mentioned what exactly that “pollution” might be. Today we are getting a much clearer picture, and it may mean throwing out what we’ve been programmed to believe about fossil fuels, CO2 emissions and global warming being the main culprit killing our oceans and planet. Now, according to research by the Marine Pollution Bulletin and others, we can add glyphosate, Monsanto’s Roundup Ready herbicide, to the top of the list. Everything in the ocean relies on phytoplankton for their sole food source. That includes whales, reefs, sponges, coral, etc. Some fish rely on getting their phytoplankton needs met by feeding on other fish who feed off the plankton. Everything is interconnected. In the ocean, phytoplankton is as at the very top of the food chain. It’s paramount to survival. Phytoplankton is a photosynthetic plant that basically amounts to ocean algae. Its biological processes are the same as land-based plants. Ocean and coral reef death can be traced to phytoplankton die-off, which has accelerated by 40 percent since the 1950’s. It wasn’t long before some researchers started asking: What new substance was introduced in the last 40 years that kills virtually all land-based plants? The answer: Glyphosate. Coral reefs are largely plant life. Glyphosate is a plant-killer, designed to annihilate any life it comes in contact with that isn’t protected by genetic modification. Run-off from agricultural spraying of this weed killer goes into our rivers and is dumped into the ocean in less than 40 days. It maintains roughly 80% of its killing capacity. The researchers found the most notable phytoplankton declines in waters near both poles, in the tropics, as well as in the open ocean. So basically, everywhere. Conventional science tells us that phytoplankton die-off is due to warmer waters from climate change. Then one has to ask oneself: Why is the die-off also occurring in the colder waters at the Arctic poles? Apparently temperature is not the determining factor, so there goes the global warming explanation. Phytoplankton die-off eventually leads to ocean acidification. Some recent studies are showing that true to the interconnectedness of nature, ocean acidification may actually have a climatic effect of its own. While climate change and ocean acidification are parallel phenomena, there are also some cross-links enabling them to interact. Rising temperatures and changing seawater chemistry are known to have an impact on marine life, and some of those impacts could, in turn, cause rising air and sea temperatures. That’s why it’s called the climate system. When you affect one thing, other things change as well. While phytoplankton is dying, so is the planet’s abundant marine life. Hundreds of Pacific salmon are disappearing at an alarming rate. Experts believe they are starving to death because the once flourishing plankton pastures have turned into lifeless deserts. This, in turn, could contribute to the increase in large-scale whale beachings and fish deaths seen in recent years. Why is glyphosate’s run-off so deadly to our oceans? Glyphosate’s half-life, or the rate at which it breaks down, is dramatically longer in the ocean than in fresh water. This is because glyphosate is a salt and in the presence of ocean salts it acts as a preservative. Even worse, it gathers strength over time leading to massive plankton and aquatic die-off. Unfortunately, this news is not being reported. In soil, the chemical’s half-life is as quick as 5 days. In bog or fresh water, it’s 49 days. Since so many agricultural countries in the world use this dangerous herbicide, glyphosate is now being detected in a diversity of water bodies when samples are analyzed. However, most countries fail to include regular glyphosate-monitoring programs. Stand-alone analytical methods are often cost-prohibitive, resulting in a long-term deficiency in global datasets (Barceló and Hennion, 2003). Australia uses Roundup Ready at a rate of 30 million pounds each year. The U.S. uses a staggering 180-185+ million pounds each year. Now imagine all the millions of pounds other countries use as well. Most of this ends up finding its way to our oceans. What if we’ve gotten the whole global warming theory backwards? What if burning fossil fuels isn’t the primary cause of climate change, but toxic chemicals ARE through a natural chain reaction? Global warming activist Al Gore was recently interviewed by Fox Newscaster Chris Wallace in June of this year. Gore admitted that on a global scale “emissions have stabilized and are beginning to decline”. So if we’ve cut down on fuel emissions, while being taxed and regulated to use these resources (the Carbon Tax), why are we not seeing any real difference? In fact, it seems to be getting worse according to Gore. The oceans are trying to tell us something, if we would only listen. Oceans play an important role in keeping the Earth’s carbon cycle in balance. If we are killing off the oceans due to glyphosate run-off, which causes widespread plankton and aquatic death and ocean acidification, which causes the amount of carbon dioxide in the atmosphere to rise along with climate temperature, then perhaps a better solution can be offered. Place a worldwide ban on glyphosate and stop it from poisoning our Earth. In 2015 Monsanto’s Roundup weed killer (glyphosate) was classified as “probably” carcinogenic in humans. This was affirmed by the World Health Organization’s (WHO) International Agency for Research on Cancer (IARC) after conducting a comprehensive review on the safety of this crop chemical. It only affirmed what independent science has been saying for years. It’s in our food, in our air, in our rivers and oceans—pretty much every where. It’s becoming more and more evident that chemical companies are destroying our planet. It wasn’t until the mid 1970’s that Monsanto started really mass-marketing glyphosate, even though it was being used experimentally since the 50’s when it was first formulated. By 1980 it had become the best-selling herbicide in the world. In the early 1990’s people really started noticing ecological changes in the Great Barrier Reef which stretches for over 1,400 miles off Queensland’s north-west coast. This reef was once home to 1,625 species of fish, 3,000 molluscs and 30 different types of whale and dolphin. Leading environmental writer Rowan Jacobsen recently wrote: “The Great Barrier Reef of Australia passed away in 2016 after a long illness. It was 25 million years old.” Death by poisoning. No ocean is immune and neither are we. Monsanto’s judgment time will come. I actively encourage all documentary producers and environmental writers and activists to start covering this disturbing topic. Life depends on it. There is something strange buried under the Court of Amenhotep at Luxor Temple in Egypt. This is not the first time I’ve felt it. A group of energy sensitives that accompanied me on my most recent trip to Egypt felt it too. 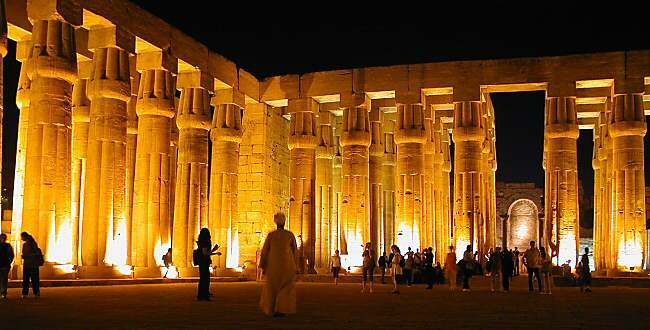 As I stood in the almost exact middle of the courtyard, surrounded by an impressive array of illuminated columns that make Luxor Temple such an awesome evening sight, I once again detected a distinct spinning motion coming from the stones beneath me. It was rotating in a counter-clockwise motion. I beckoned the others in the group to come and stand with me. Without telling them what I had discovered, I waited to gauge their response. “Whoa, what’s that? !” one of them asked. “It feels like a vortex,” another chimed in. Everyone agreed that whatever it was, it was definitely spinning in a counter-clockwise motion. The strong sensitives of the group started to pace off the area to determine its energy perimeters. They concluded it was approximately 12 feet square in diameter and somewhere between 8 – 10 feet down, perhaps deeper. The construction of Luxor Temple goes back thousands of years to the 18th Dynasty BC. It was dedicated to Amun Ra, the oldest and ultimate God of the entire Old Kingdom, known as the God of Kings and the King of Gods. His name is significant. Amun Ra means “the Hidden One” or “the Invisible One”. It was thought that Amun Ra created himself and then created everything else while remaining distanced and separate from the world. Luxor Temple would become known as a repository of Amun Ra’s “forbidden” knowledge. It held deep secrets, which it still holds to this day. Amun Ra was also considered the Lord of Truth and Father of Man. His true date of existence is only an educated guess, even in the Pyramid Texts of the Egyptian Book of the Dead. While Amun Ra was a well-known Egyptian King, his origins are mysterious. Some say he did not come from this world, which is why he was known as the Hidden One. It was also thought that he could regenerate himself by becoming a snake and shedding his skin. Ancient Egyptians worshiped snakes, especially the cobra. The role of the serpent was prominent in Egyptian culture. In ancient Egypt, as in many cultures, a snake swallowing its tail was a symbol of rejuvenation and eternity—an endless cycle of beginnings and endings. The serpent represented both good and bad: life energy, resurrection, wisdom, power, cunning, death, darkness, evil, and corruption. After identifying the strange spinning energy under Luxor Temple, my Egyptologist friend informed me that they had excavated a large granite cobra statue from under the complex a few years back, not far from the spot where we had identified the strange anomaly. 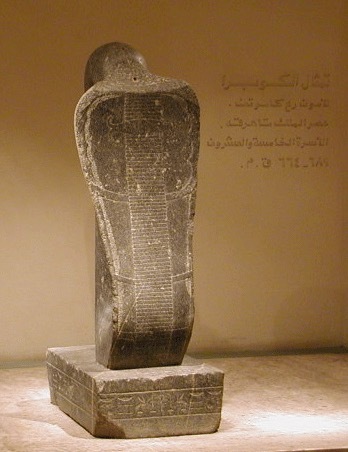 This cobra statue is now prominently displayed in the Luxor Museum and its powerful energy signature is quite palpable. There were snake-worshipping cults during the time of the Amun Priesthood. These cults were known as the Brotherhood of the Serpent or Brotherhood of the Snake. Some of these cults sill exist today. During ancient Egyptian times some of the High Priests of Amun at Thebes were a corrupt lot. With such cult power and influence they were effectively the rulers of Egypt from 1080 to c. 943 BC. The Amun priests owned two-thirds of all the temple lands in Egypt and 90 percent of her ships and many other resources. Consequently, the Amun priests were as powerful as the Pharaoh, if not more so. Could they have activated something very powerful that needed to be hidden deep beneath Luxor Temple? Whatever is under the stones of Luxor Temple, it appears to emit an electromagnetic field, which needs to be measured Over the years, there have been reports of strange light emissions at Luxor as well as a number of UFO sightings according one of many MUFUN reports. Could there be an ancient UFO hidden under the courtyard in homage to its creator God Amun Ra which is still emitting a field effect? It’s not that implausible. It is widely rumored amongst Egyptologists that the fourth floor of the Cairo Museum, always closed to the general public, houses some very strange alien-looking mummies that will forever remain under lock and key. We may never know what really lies beneath Luxor Temple. Temples were often built over existing temples. So much of Egypt’s deeper secrets will forever remain hidden under sand and sediment, just waiting for man to be re-awakened to the true alchemy of the universe.